Price Drop! Was: $179.95 Now: $109.96. For a limited time only, while stocks last. 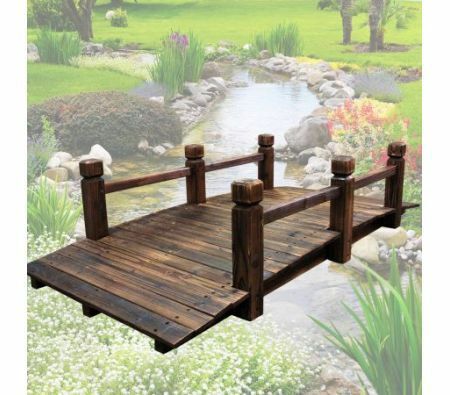 Add a spot of tranquility to your garden with this Wooden Garden Bridge. Classic arch design made from treated timber fir wood, this cute little bridge has a wooden plank design with stumpy miniature rails. Ideal way of creating an interesting talking point in your garden that will impress guests and family. Use it along the ground as a decorative feature or suspend it over a garden pond. Create a sense of wonder within your own private garden getaway and relax your weekend away! (L x W x H) 160cm x 70cm x 35cm approx. (L x W x H) 162cm x 20 cm x 22cm approx.